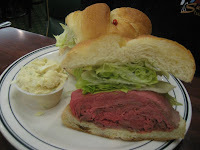 One thing we seem to lack in California are good Jewish Deli's especially in L.A. Thank goodness that we have Brent to change that. One thing I do have to say however, is that the taste of the food does change based on if they are busy or not, but don't let that stop you from having a great, hearty meal with Jewish love. Shalom! I've went to Brent's a couple of times and the last time I went there, I was actually a bit disappointed. I usually always get the grilled turkey sandwich, but I decided to try their cold one instead with some soup. The sandwich wasn't all that great. It was definitely filling but lacked in flavor. It was also a little bit dry. So I recommend staying away from the cold sandwiches and sticking with the grilled ones. 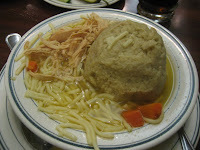 I never had matzo ball soup before, so I thought I would give it a try. They definitely give you enough of it. It tasted like good chicken noodle soup with a big ball of mushy bread that was the size of a baseball. It was good, didn't find anything wrong with it. If I ever get sick this is something I would love to eat. I had to take more than half of it home because they gave so much. 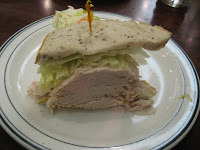 I can't stand eating raw meat, so I had my friend Anna eat this sandwich for me. She said it was all right, but it was a bit too raw for her and a bit gammy. She said it also lacked in flavor and I trust her judgment. Here's some tips you should know if you're going here. 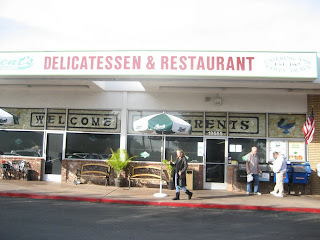 Don't get the burgers, I've heard they were kinda salty and it doesn't make sense why you would be going to a deli in the first place. Don't order the cold sandwiches. They lack in flavor in my opinion, but the pastrami should be fine. This place is kinda pricy, but don't expect leaving without taking something home. They give a lot of food. Their bakery is awesome however, the lemon bars are to die for. Plus the black and white cookies are like miniature cakes than cookies. Make sure you stop by there afterwards, if you have room. TASTE: 4/5 Certain sandwiches aren't that great, but the grilled ones are awesome. ATMOSPHERE: 4.5/5 Feels like a good NY style restaurant. Service: 5/5 I would get my cup refilled every four minutes. The waitresses were always very kind and generous in their effort to make us feel welcomed. PRICE: A bit pricey in my opinion. $20+ per person. Depends on what you get. OVERALL: 3.5/5 Good atmosphere, decent food, but loses points on price and the taste of certain sandwiches. Calling all vegetarians out there. Happy Family is a 100% all you can eat buffet for vegetarians. They have normal Chinese food dishes as well, but the vegetarian buffet is what this restaurant is known for. If your looking for an inexpensive way to eat healthier then you can't miss this place. The all you can eat buffet costs $12.99, but make sure you get there early since they close at 9:15 PM. This is one of my favorite dishes on the list. 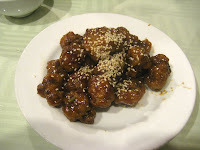 Their delicious sesame chicken. It's not really made from chicken though, it has the texture of tofu or mushrooms, but man is it tasty. I can't really describe why it's good, but whenever I think about this dish, it makes my mouth water. It's sweet, tangy and healthy too. What can be better? 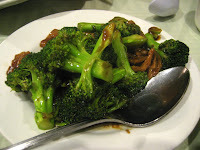 I personally love broccoli, so getting this dish was a no brainer. I don't know what kind of sauce they used, but somehow they made the broccoli sweet. The broccoli was still crunchy, had a really good flavor with garlic and the fried pieces of "pork" (tofu) went great with it. I never thought vegetarian food could make me full. I literally couldn't eat another bite after going to this place. I also have a fondness for tofu. 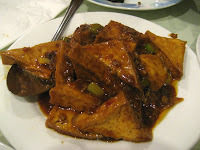 I know it's not everyone's cup of tea, but if you do like tofu, make sure to get the tofu with spicy brown sauce. It's just amazing, I actually finished this one by myself since Ian doesn't care for tofu. Put this with some steamed rice and I'm in heaven. ATMOSPHERE: 4/5 This depends on when you get there. They are usually busy. Service: 3/5 The service drastically depends on if they are busy or not. They only have three waitresses so getting something may take a while because they are so popular. PRICE: Comes to about less than $20 per person. OVERALL: 4/5 Very healthy food for cheap, but have very long wait times when they are busy. Located on the upper floor of this small mall is someplace that offers not only one of the tastiest places to eat, but also one of the most economical places to eat and also a healthy place to eat. Happy Family 3 is an all vegetarian restaurant that none the less offers ‘meat’ items on the menu. Although in this case all the meat items are actually vegetarian fakes. They do some pretty amazing stuff with soy and other vegetables to give them a meat like taste and texture. Now I wont claim that the chicken always tastes like chicken or the pork always tastes like pork. But pretty much everything on the menu always tastes good. For $12.95 you can get the all you can eat buffet which consists of a menu with 64 items on it. You may order as many of those dishes as you want. You’ll also get steamed rice, soup and some really tasty fried (or steamed) bread. This is one place to go where the more the merrier, since then you can order more dishes and get an even broader sampling of all they have to offer. But even a group of 2 can manage to order several dishes. Regardless of how many people you are with, I would definitely recommend ordering the dry sautéed string beans and the sesame chicken. I haven’t met anyone yet who didn’t like, and want more of, those two dishes. The ‘pork’ with broccoli is quite good. Some of my other favorite dishes are: Chicken with cashew nuts, home style deep fried tofu with hot sauce, eggplant with basil and with hot sauce, stir fried rice cake with vegetables and stir fry spinach. The minced squab in lettuce also seemed really popular last time i was there, although I didn’t get a chance to try that yet. Let me know if you have.